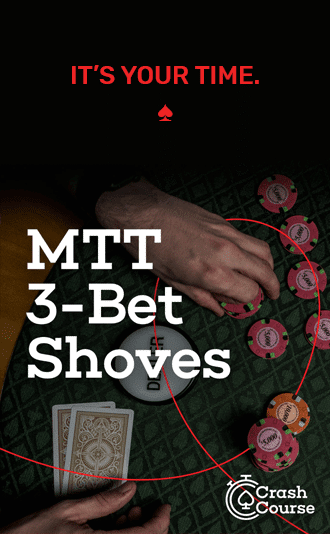 Aside from the fact that the title of this post could be construed as very perverted, it’s important that you learn how to beat yourself in poker. You need to know how you play, you need to know how you normally react to certain actions, and you need to know where your weaknesses are. By analyzing your own game and learning how to beat yourself you will actually find a lot of leaks in your own strategy (and in the strategy of similarly-styled opponents). So where you do start this process? Well I’ll explain what I do during this process and also why. First, I start by writing down ALL of my ranges. Starting from preflop, I write down my default opening-range from EP, MP, LP, and the blinds. Of course table dynamics can alter this, but start by writing down your default ranges first. Once you’ve done this, go open up Equilab, plug in each range, and note how wide of a range (on a percentage basis) each of these ranges really are. Then I write down the range I would give a 3bet action with from each position facing a 3bet from each position. So if I open from EP and face a LP 3bet, what will I 4bet with and what will I call the 3bet with OOP? Again, open up Equilab and see how wide these ranges are on a percentage basis and also see how often you are folding and if that’s exploitable in anyway. For instance, if you open from EP with 22+/AQ+/KQ and would only give a 3bet action with JJ+, you are folding 100% – (1.8/9.5) = 81% of the time. In doing this I also think about my opponents who player with similar VPIP and PFRs to myself. If I am playing in this way, is it possible that their ranges and thus exploitable tendencies look similar? Then I look at the range I call an open-raise with if I’m in EP, MP, LP, and the blinds when facing an open-raise from EP, MP, LP, or the SB. I look at my over-calling ranges, cold 4bet ranges, etc. Again, I’m trying to understand my default ranges. Remember, you need to be honest with yourself here. Nobody will see this work but you, so don’t cut corners and don’t try to make your ranges look better than they may actually be. Be honest and you’ll quickly find range inaccuracies. So what are the actual benefits of doing this? Well first, you find areas where you are easily too tight or too loose. Secondly, this work forces you to start comparing ranges and percentages. Not many players know what X range looks like in percentage form. For instance, did you know that 22+ and any two broadway cards is 18% of hands? Did you know that 66+/AQ+ is 6.5% of hands? That’s OK, I didn’t either until I did this work! Once you have the ranges hammered out, start looking at your FoldvX action ranges and percentages. In the example above where we opened 22+/AQ+/KQ from EP and only gave a 3bet action with JJ+, we were folding 81% of the time. Anytime you are folding well-over 2/3 of the time, you are likely folding WAY too much (unless your opponent is 3betting WAY too rarely). Explore your foldv3bet ranges and see if there are any issues here. For instance, if you steal 40% of the time, but only give a resteal range with the top 5% of hands, you are outright exploitable when facing resteals. Any good villain will figure this out quickly and make your life a living hell. So find these kinds of leaks early and start fixing them right away. Fixing a leak in this situation could be done multiple different ways. To draw a parallel, my son was recently complaining that he has a spending problem. He makes $10/week for allowance but spends $4/day on snacks and is quickly broke again. In trying to find a solution he spent his energy trying to figure out how to curb the spending issue (great job for a 10 year old!). But he forgot that there are 2 aspects of this problem. One of them is the spending, but the other is how much he is making. He could work on fixing the problem from the beginning (earning), or from the end (spending). Fix both, and now you are crushing. It’s the same issue thing in poker. You can fix your original range (the actual range you opened with, called an open with, 3bet for value with, etc), and/or you can fix your continuance range (the range you continue with when villains gives you action). If are outright exploitable when you face a resteal, you could steal with a strong range of hands. You could also combat the resteal more often and either call or 4bet with a wider range of hands. Both solutions fix the issue of being outright exploitable and folding too often against a resteal. There is a natural inclination to panic when you find out you are outright exploitable in a given situation. But don’t freak out and make huge changes to your ranges without first giving it some thought. For instance, say you are outright exploitable when you open from EP and face a 3bet (you are folding too often against these 3bets). Well, do you really face many 3bets in this situation? If not, then your opponents aren’t really exploiting you and thus being outright exploitable isn’t really a concern. Understand when you can be exploited, then understand if you are actually being exploited. Besides just being easily exploited, consider if your ranges are too tight or loose. Are you giving 3bets action too liberally from OOP? If you aren’t sure, consider what a default 3bet range looks like in your game. Run your range vs that range in Equilab. Run your range in Flopzilla and see how often it hits/misses the flop. Run villain’s range in Flopzilla and see how often it hits/misses the flop. Again, this exercise has the benefit of ingraining this math stuff deep within your brain. The more work you put in, the easier it is to recall it in real-time. This work will take hours if you do it correctly, but in doing so you will fully understand your ranges and begin to get a better handle on the math. Once you can think of ranges in mathematical terms, things get much easier. And the good news? Well the good news is that you continue doing this work postflop! Start with the flop and see if you are folding too often to check-raises. If so, is this a spot where you can begin check-raise bluffing your opponents more often? Again, draw paralells between your ranges and similar opponents to find easy ways to increase your edges. Enjoy this work, and do it every 4-6 months. It may seem like a lot, but it will pay dividends if you do it well. Good luck with it all, and let me know if you get stuck. how does this tool help?? Hi Nick. Which tool are you referring to (Equilab or Flopzilla)? Both are super helpful and allow you to study hands and situations in tremendous detail…which can then be extrapolated and used in similar situations in the future.